PTB: We talked about the broad nature of his powers last time, but what’s with the magic bullet trajectory of Darksied’s eyebeams? KevinMLD: Those would be the eyebeams that I mentioned last time as his main power. What those eyebeams are capable of seems to vary from writer to writer. No one here seems lost in the past or reliving variations on their life as we saw with Batman and Mr. Miracle in Darkseid’s recent appearances. PTB: The beams’ pursuit of the Flash and Superman made for a couple of fun panels. I can’t help but wonder if this chase scene was meant to illustrate that Flash is as fast as Superman. KevinMLD: If it wasn’t intended to do that, it’s certainly the ultimate result. PTB: While on the topic of Barry Allen’s powers, is vibrating through people/objects a trick he’s used before? KevinMLD: Barry Allen’s been dead my entire comics reading life, so I’m not sure. But I seem to remember reading at some point that vibrating through things was something Barry could do that Wally West couldn’t (or maybe it was Bart Allen that couldn’t). I think Barry used to vibrate through walls on the old Flash TV show too. So I’m going with yes. PTB: If one beam from Darkseid can take down Superman, how is this fight not over already? KevinMLD: It seems like the Justice League is not something that Darkseid has deemed worthy of his attention. After beating up Green Lantern, who attacked him first, Darkseid just walks away. They’re mosquitoes. PTB: Again, with Superman taken out by one beam, what does it mean that Green Lantern was up and about after Darkseid leveled him? KevinMLD: That the Green Lantern ring is one of the most powerful weapons in the universe. PTB: So there’s no obvious commentary on Hal Jordan as the wielder of that ring? KevinMLD: That he’s too dumb to know when to back down and try another method of attack? 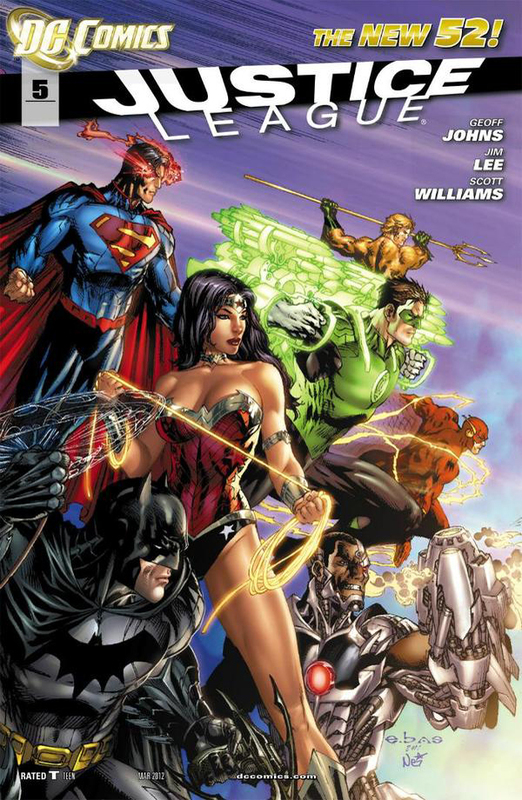 PTB: I recently read some criticizism that Cyborg is the only member of the Justice League without his own title. It’s true, but I think having his story told exclusively in the one of the highest selling books of all time is better for the character at this point. KevinMLD: I continue to hate Cyborg’s involvement with this book. Green Lantern inviting Cyborg to join the pursuit of Darkseid when Cyborg doesn’t even know his own abilities is idiotic. 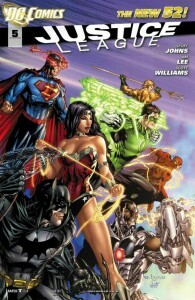 I’m totally in favor of Justice League members who don’t have their own title though. Having a few characters that the writer can have full control over creatively tends to make these types of team-up titles more interesting in my opinion. Johns is very unlikely to kill Superman or Lois Lane in this title, but Cyborg’s dad? Fair game. PTB: I liked the simplicity of Cyborg joining the team in this issue. KevinMLD: Sorry that I just called it idiotic then, but I really meant it. He’s a high school student with no training or idea of his own capabilities. Why would you invite him to fight a god? PTB: That could certainly come back to haunt Hal Jordan, but he has no way of knowing that Cyborg isn’t a more established hero like the rest of them. Alternatively, we could see that Cyborg’s software makes up for his inexperience. There’s a nice bit of relationship building with Batman and Green Lantern and it really gets at the nature of Bruce’s feelings toward metahumans. It was good to see some development beyond the animosity between these two in issue #1. KevinMLD: I liked this scene until Bruce took off his mask and told Hal his secret origin. PTB: Is Bruce normally one to reveal that he’s Batman? I seem to recall an old Justice League plot that revolved entirely around the team being upset that they didn’t know the secret identities of Batman and Superman. KevinMLD: The Bat-family secret identities used to be some of the DC Universe’s most protected secrets. Bruce, decisions like this are how you get your partner’s father murdered, dummy. And why would he leave his mask off as he pursued Superman? It’s just a weird decision. PTB: It’s weird, but I have to assume we’ll see what this is all about in the next issue. I appreciated that Wayne wasn’t a household name when he told Hal Jordan who he was. KevinMLD: I also thought this was an interesting touch. The question is does Hal not know him because he’s so stuck in his own world or is Bruce truly not famous? And if Bruce isn’t famous, I wonder if Lex Luthor is. PTB: Things end with a “BOOOMM.” I take this is the “Boom Tube” and on the other side is planet Apokalips? PTB: That page looks great, particularly the colors. 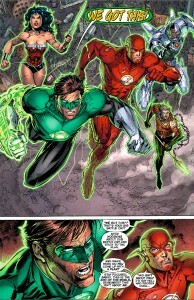 Lee’s artwork is solid throughout most of the action scenes once again, but the “We got this” page with the assembled team lacked some cohesion. KevinMLD: I kind of feel like Lee’s artwork has gotten worse over the last two issues. There just continue to be panels in which I’m not totally sure what’s happening at first glance. I’m guessing he was rushed, so I’m looking forward to him getting a few months off to get caught back up. 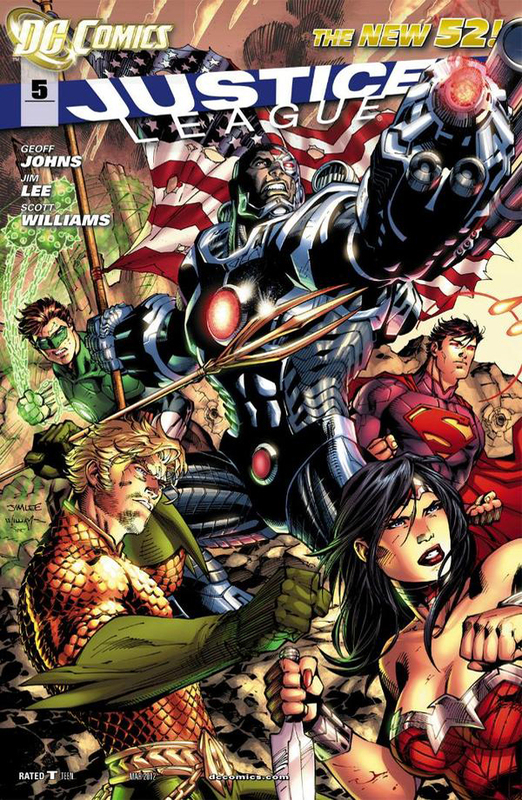 PTB: Lee handles the group much better in the cover image, but why does Cyborg have that flag? KevinMLD: I really dislike this cover. Aquaman’s face is weird. Superman is in a goofy pose. Cyborg’s upper torso is so much larger than his waist. It just doesn’t look like Jim Lee drew it. Even Wonder Woman looks just off-model. Also, I noticed there were multiple inkers for this issue. I assume that affected things as well. PTB: The backup pages with the character designs are interesting but dry. I’d prefer things that drive the story a bit as we’ve seen in previous issues. KevinMLD: I skipped it. This is just filler so DC can charge a higher cover price. I’m ready for the Shazam back ups. PTB: And he’s officially Shazam now? No more Captain Marvel?